Recent work by Ádám Kokesch can be viewed at two parallel exhibitions with a common denominator. As with the central bauhaus idea, in the work of Kokesch workshop, laboratory and exposition converge in the studio house. Kokesch’ mobile works can be taken anywhere, the venue determines the way they are mounted. This ‘duo exhibition’ allows the viewer to compare the impact of his work in two very different environments: an ‘industrial archeological’ venue in the dunes of Bloemendaal and a private home in Amsterdam. 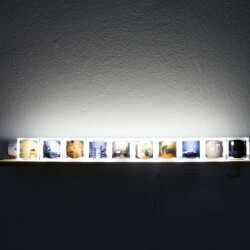 The hybrid objects and installations combine traditional techniques such as paintings behind glass, with contemporary material (acrylics, perspex) and cool industrial design. Geometric abstract patches in various colour combinations evoke an image of the intestines of computers and other high-tech machines. In his work, Kokesch refers to the world of data systems and programming languages linking visual signs and signals and thereby showing us the poetic beauty of that world. Some objects are small as a cufflink, others resemble models on a floor or table, or are mounted to a wall as if they were minimalistic paintings or pictograms in public space. 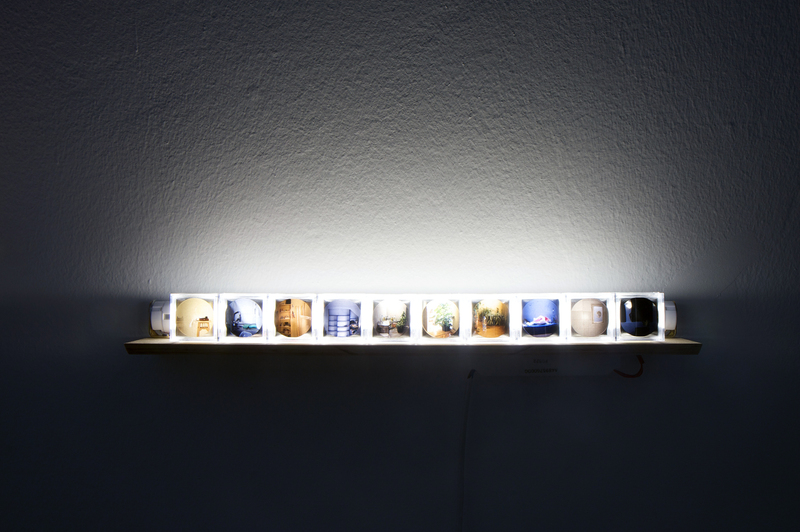 Some emerge from the ceiling and evoke the association of monitors, suncollectors, a photo studio or theatre. Ádám Kokesch (Budapest 1973) graduated from the Hungarian Academy of Fine Arts and participated in group exhibitions at the MMSU in Rijeka, Croatia (2005) and the Ludwig Museum in Budapest (2010). His work was shown in The Netherlands at W139, Amsterdam (2004). Saturday 13 November 2010, 11-14 hrs. with the artist. 11.30 hrs. : Address by Jan Kennis, Deputy Director of SICA and former Cultural Attaché at H.M. Netherlands Embassy, Budapest. Hoge Duin en Daalseweg 21b, Bloemendaal. Sunday 14 November 2010, 15-18 hrs. with the artist.